In 1966, the world of motorsport was graced with the birth of an entirely new form of racing. With the world’s thinnest rulebook, the Canadian American Challenge became a safe haven for creative racecar designers. Under the FIA’s new Group & regulations, the only requirements were a 2-seater cockpit, two rudimentary doors, enclosed wheels, taillight, a starter motor, dual braking system and a roll bar. Other than that, every aspect of the car’s design was completely up to the imagination of the designers. The placement, size and number of engines was unrestricted, as were the size, amount and types of wheels and tires. Aerodynamic aids were also free to implemented wherever the constructor deemed them necessary, resulting in incredibly advanced designs from the inventor of downforce himself, Jim Hall of Chaparral. Already in the very first season, Can Am was pushing the envelope in car design. 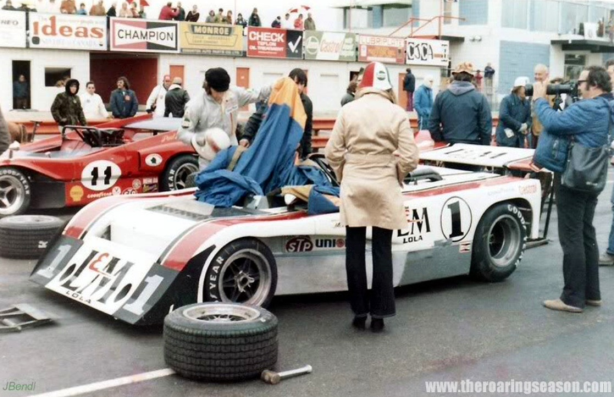 Aside from the wanton craziness of Chaparall, the first season of Can Am saw comparatively unremarkable mid-engined machines from established firms McLaren and Lola dominate the field. As a pioneer of mid-engine racers with 1963’s Mk6 GT Eric Broadley’s Lola Cars predictably took the very first Can Am Cup with 1964 Formula One World Champion John Surtees (GB) at the wheel of a T70 Spyder. John Surtees took Lola to new heights by winning the 1966 Can Am Cup. The initial success compelled Broadley to expand his American exploits, leading to a bond with team owner Carl Haas, who became Lola Cars’ official importer. The partnership failed to produce the desired results however, as Lola lost its competitive edge over the years. Like every other outfit active in Can Am, they eventually had to bow down to the immense dominance of McLaren. The orange machines were so untouchable the series earned the nickname “The Bruce and Denny Show“ due to Bruce McLaren (NZ) and Denny Hulme (NZ) winning virtually every race. While they were struggling to keep up, Eric Broadley and designer Bruce Marston were certain they’d break the chain for 1971. The wedge-shaped T220 managed to lift Lola's spirits in 1970. A lucrative sponsor deal with Philip Morris Tobacco’s L&M cigarette brand gave the team a much bigger budget for 1970, but the T220 that resulted from this was unable to properly challenge the McLaren M8D, which won 9 out of 10 races. The incredibly short 223 cm (88 inch) wheelbase made the T220 a rather nervous animal. Though it was very quick, the erratic handling prevented driver Peter Revson (USA) from maximizing its potential. With a best finish of 2nd at Mid Ohio behind Denny Hulme’s McLaren he was certainly close though, and a more stable long-wheelbase evolution dubbed T222 promised to be even more competitive. 1969 Formula One World Champion Jackie Stewart joined the fray for 1971. To Marston and Broadley, that design yielded more disadvantages than advantages, as it was prone to unpredictable pressure changes while following other cars, and susceptible to lift when going over bumps. In extreme cases, this could lead to the vehicle flipping over entirely. So instead of increasing downforce, the men intended to decrease lift. The short and stubby T260 was a big departure from the norm in Can Am. The new T260 demonstrated this thinking by sporting an unusually bluff nosecone. This served not to direct the air over it, but through it. The air was forced under the car, and then exited through a series of small mesh-covered holes in front of the windscreen to equalize pressure and prevent lift, while secondary flows of air spilled out the side of the car behind the front wheels. In theory the idea worked perfectly, but in practice the team found the car’s center of pressure had shifted too far rearward. In an effort to correct this imbalance, the T260 was fitted with a rear wing placed in right behind the intake trumpets of the huge Chevrolet V8. The peculiar location added to the car’s strangely short appearance. Frank Gardner testing the T260 at Silverstone, 1971. Mechanically, the car was made up of a full aluminium alloy monocoque chassis, which completely enveloped an all-aluminum 8.1L 496 Chevrolet V8 fitted with Lucas fuel injection. Tuned by George Foltz, the big-bore behemoth produced slightly over 760 horsepower at 7000 rpm and a titanic 837 Nm (618 lb ft) of torque. A heavy duty Hewland LG600four-speed manual transmission then directed the fury to the rear wheels. On either side of the chassis, fuel was stored in a 30 gallon (113 L) fuel bag. Front suspension consisted of unequal length wishbones, with the Bilstein coilovers laying flat across the chassis tub. The reason for this was the planned inboard disc brakes, which were removed at the request of Lola’s new star driver, 1969 Formula One World Champion Jackie Stewart. Stewart had chosen to combine his drive for Tyrrell in F1 with a Can Am campaign, and demanded the removal of the inboard front brakes for a very personal reason. The previous year, he had lost his good friend Jochen Rindt after a brake driveshaft had failed at Monza. Concerned for his own safety, he refused to race the T260 with the technology fitted, leaving the car with inboard brakes at the rear, which were attached to the transmission and therefore had no need for a much smaller and weaker shaft dedicated to driving only the brakes. Jackie Stewart in his office. Another added safety feature was soft padding on his steering wheel. The deletion of the inboard brakes robbed the Lola of the increased balance associated with the lower unsprung weight they would provide, but the team couldn’t afford to lose what was then one of the fastest drivers in the world. The brakes were cooled by holes in the nosecone, and distinctive ram-air pipes snaking along the rear section provided fresh air for the rears. Thanks to the aluminium chassis and fiberglass bodypanels, the car weighed only 725 kg (1598 lbs). This compared rather unfavorably with the leading McLaren M8F, which put down 689 kg (1519 lbs) on the scales. However, the Lola had 20 horsepower over the big orange machine, making it a tough fight on paper. The two cars couldn't have been more different. 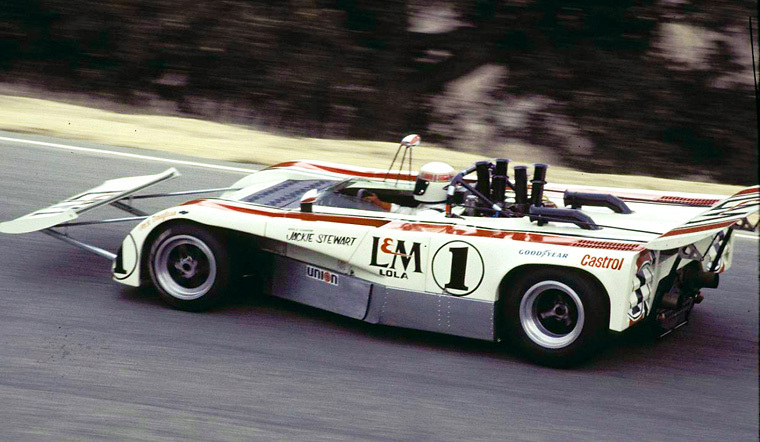 As Lola and McLaren were the only two serious manufacturers competing in Can Am, the 1971 season looked like it would come to a grand battle between the two. Other competitors that season were BRM, Shadow, a half-hearted Ferrari and an emerging Porsche. Carl Haas’ team included one T260 (chassis HU1) for Jackie Stewart, with HU2 as a spare. His teammate was Japanese rookie Hiroshi Kazato, who piloted the older T222 model. Predictably, all eyes were on the Scotsman, as he was Lola’s biggest asset in the fight for the title. The previous season he had been running the insane Chaparral 2J “Sucker Car”, so the decidedly less mad T260 should’ve been a walk in the park for him. The T260 made a promising debut at Mosport. This assumption turned out to be wholly false. Thanks to its unconventional aerodynamic design, the car was unbelievably twitchy, as the T220 had been. Since the odd nosecone developed far less downforce than a conventional example, the T260 had a habit of understeering before violently snapping its back end around as the driver tried to correct the understeer with the throttle. Nevertheless, the knife-edge handling did little to curb the Lola’s raw speed. At the first round of the season at Mosport in Ontario, Canada, Jackie Stewart immediately conquered pole position. In the process he had cleanly beaten both factory McLarens driven by 1967 Formula One World Champion Denny Hulme and Lola defector Peter Revson. In fact, there was a full seven tenths of a second between Stewart and Hulme, and 5.1 seconds between the T260 and the T222 driven by Kazato. Unfortunately the Scot was unable to capitalize on his blistering pace, as an oil leak caused the gearbox to seize after 18 laps. Stewart beside Hulme on the front row, St. Jovite, 1971. McLaren struck back at St. Jovite, where Denny Hulme clocked a 1:32.900, three tenths of a second quicker than Stewart in the Lola. Starting from second, he hounded the New Zealander throughout the the two-hour race. On lap 52 of 75, Hulme started to tire out, as he was suffering from a form of stomach flu. The pressure of trying to outrun Jackie was too much for him, so he chose to slow and let him by. The little Lola instantly flashed by, and was never seen again. In only his second race for the team, Jackie Stewart had scored his first Can Am victory. Jackie Stewart negotiating the many twists and turns of Road Atlanta, 1971. At Road Atlanta, Stewart started from third on the grid, a full second behind polesitter Denny Hulme. He managed to grab the lead however, as the short-bodied, nervous T260 had incredible pace on the twisty circuit. Sadly a puncture dropped him back, before a sheared rear damper mounting put an end to his hopes of back-to-back wins. Before his retirement he managed to set the fastest lap, which proved even quicker than Hulme’s pole time. Jackie Stewart in front of the two McLarens. Note the Porsche 917K of Mario Cabral being lapped. Round 4 of the season took place at Watkins Glen in upstate New York, a track Jackie Stewart knew very well from his experiences in Formula One. His knowledge of the lightning-fast circuit, and possibly the small diveplanes added to his car’s nosecone gave him the edge to beat Denny Hulme by a microscopic .120 of a second. From pole position Stewart comfortably took the lead, until yet another puncture foiled his charge. With pitstops still a myth in Can Am racing, he lost a lap while his team replaced the damaged wheel. Setting off again and mowing through the field and setting the fastest lap once again. He finally stopped the car on lap 56 after noticing some harrowing vibrations coming from the drivetrain. His suspicions were confirmed by the Haas mechanics as the early warning signs of a failing transmission. Haas mechanics working on Stewart's T260 in the paddock, Mid Ohio, 1971. At Mid-Ohio, Stewart’s infamous advocacy for track safety came to the forefront again. Featuring numerous unprotected trees and telephone poles, the venue definitely wouldn’t have fit any modern safety standards, but drivers complaining about such things was still a relatively novel occurrence in 1971. Regardless, Stewart’s high profile and vocal opposition to the track wasn’t to deaf ears, as organizers scrambled to remove poles and add straw bales overnight in an effort to face his criticism. The next morning though, the F1 champ was unrelenting. Claiming he would “run, but not race“ on the also extremely bumpy track, he decided to take part in qualifying nonetheless. His concerns were confirmed during that session though, as his car suffered not one, but three rear suspension failures. His self-proclaimed conservative driving still netted him third on the grid behind the McLarens. At the start he grabbed second place to split the orange monsters, but was unable to keep with Peter Revson as he screamed away in the distance. With 8 laps to go, Revson’s driveshaft snapped after dealing with 72 laps of immense bumps, handing Stewart the lead. As Denny Hulme had succumbed to the same issue, Jackie Stewart cruised to a rather ironic win. A new McLaren-inspired rear wing was fitted for Road America. Road America saw a a return of the diveplanes used at Watkins Glen, and the addition of a large McLaren-style rear wing mounted between two large struts. Since wind-tunnel testing was still in its infancy, Eric Broadley and Bruce Marston were basically in the dark as to what it would do. Jackie Stewart qualified the revised car in third once again, but had to concede a hefty 2.415 seconds to Hulme’s McLaren. Ten laps in his race was over already though, as the big Chevy had gotten too hot for its own good. The T260 was returned to the standard configuration for the race at Donnybrooke. Because the new aero package had yielded no real gains in performance, Broadley and Marston returned the car to its original configuration for round 7 of the season at Donnybrooke, Minnesota. Stewart was again over 2 seconds behind the two McLarens in qualifying, as the series’ leading team had clearly been developing the M8F in a much more structured fashion. It was becoming painfully clear that Lola was falling behind at an alarming rate. The race confirmed this fear, as the T260 finished 6th, 2 laps down. Yet another random bodywork change. Edmonton, 1971. Edmonton International Speedway in Canada hosted the 8th round of the series, and Lola came in with yet another extensively modified machine. Now the T260 had been fitted with a sharp-edged, more shovel-like nosecone providing vastly more downforce, which was married to a larger rear wing placed further back to compensate. The changes saw the gap between Jackie Stewart and Denny Hulme drop back to 1.9 seconds, but the Scotsman was still third behind the other McLaren of Peter Revson. Luckily he stayed out of trouble this time, and scored a well-deserved second place behind his F1-colleague in very wet conditions. Round 9 at the famous Laguna Seca circuit would see the single most insane aerodynamic modification yet. Apparently enthused by the improvements made with the shovel-nose in Edmonton, Eric Broadley went on better by coming up with what he affectionately called The Cowcatcher. This huge slab of fiberglass hung out far in front of the car suspended by large aluminium poles. Like before, the rear wing was mounted further back on smaller struts, creating a comically disproportionate ratio between the tiny bodywork and the massive wings. None of the Speed Racer-additions to the car seemed to work very well though, as Stewart qualified fifth behind the McLarens and the new titanium Autocoast Ti22. On race day the performance was good however, as Jackie Stewart once again recorded a second place behind the McLaren of Peter Revson. Stewart coming out of the famous Corkscrew, Laguna Seca 1971. For the final round of the season, the Lola team decided to retain the weird Cowcatcher. For once in its life, the T260 had some continuity in its body design. The endless straight of Riverside Raceway in California would be a challenge for the short car though, as it had very little in the way of high-speed stability. The Cowcather on the grid at Riverside, 1971. After the session was over, 1.5 seconds still separated Jackie Stewart and Denny Hulme, with Peter Revson sandwiched in between. During the race he fought both McLarens like a lion, but his car was beginning to fail him. As it turned out, water had seeped in with the car’s engine oil, causing catastrophic engine failure. In his final Can Am race, Jackie Stewart unceremoniously retired. Part of him was glad the ride was over though, as the physical demands of combining his F1-career with a campaign in America driving one of the most aggressive cars in the business had taken their toll. Adding insult to injury, he had contracted mononucleosis, a glandular infection that made it unable for him to sleep, and severely drained his energy. 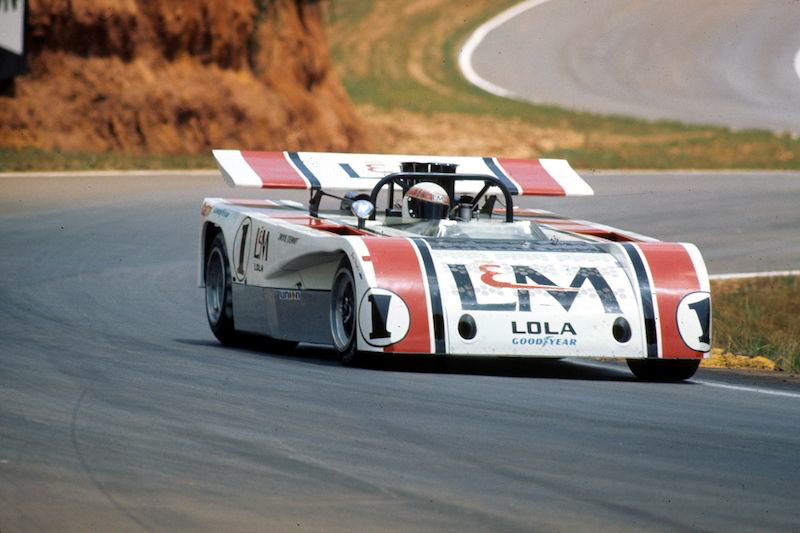 The Lola T260 was a strange machine built on some very misguided principles. Seeing an opportunity to be different and perhaps gain an edge over the more conservative but impossibly dominant McLaren team, Eric Broadley and Bruce Marston sought a new way to improve front-end grip. Unfortunately their plan to decrease lift instead of increasing downforce proved to as unconventional as it was unwise. The end result was a car so nervous and twitchy it was virtually undrivable by anything other than a truly world-class driver. Even the fastest man of the early 1970’s had his concerns about the car, no doubt exacerbated by the disconcerting randomness with which Lola added and removed bodywork. The T260 in present day, note the forward placed wing combined with the Cowcatcher, another Lola anomaly. The car proved to be fast but fragile despite its many handling problems, but a lack of clear vision and a structured development program would be its downfall. After initially being to challenge and even beat the McLaren juggernauts, the T260 quickly dropped back in the second half of the season.